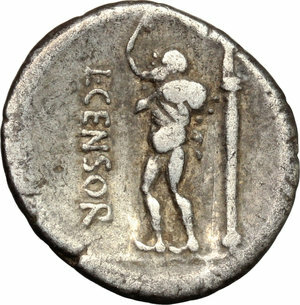 It is fortunate that the specialized collection of denarii of L.CENSOR with symbols, presented here, can be accompanied by a study never undertaken so far. The paper I denari di L.CENSOR con simboli/lettere (RRC 363/1a-c) will appear in Monete Antiche Nov-Dec 2018 and its authors have kindly agreed to provide us a preprint, from which this summary is drawn. They were welcome to profit from an in person examination of this collection at our place. Additional data and information are presented and discussed in the paper. L. MARCIVS CENSORINVS was in the IIIvir monetales college with P. CREPVSIVS and M. LIMETANVS. This triumvirate is the most investigated in the whole RR period thanks to the coinage of Crepusius, whose corpus of 3000+ specimens was gathered by Ted Buttrey over the course of his whole lifetime. The authors of the new paper have greatly benefited from his results and have put the whole IIIvirate production of this college under a new light and interpretation. In fact, it features very peculiar characteristics; it is the only one where all the moneyers produced an issue under their single names and also, in parallel, a joint issue (RRC 360/1). 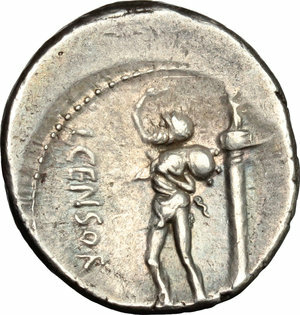 Under their new framework, the authors are able to address all of these features and, of special interest here, the reason for L.CENSOR having this signed, very tiny section, in addition to his bulk of un-marked coins (20 dies against about an estimate of 900). These coinages were produced in Rome under the Marian faction, during the First Civil War between the Marians and Sulla. At the end of 84 BC, the Marians were preparing, with a levy of 100.000 men, for the fight against Sulla, who landed at Brundisium from the East in the Spring of 83. For this large army one can estimate a requirement of 15 million of denarii, which matches very well with the production of the IIIvirate under discussion. 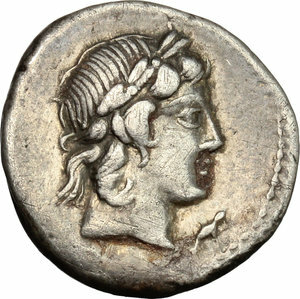 2) the big Capitol fire of 6 July 83 BC strongly influenced the coinage of that year, because the Mint was completely destroyed. 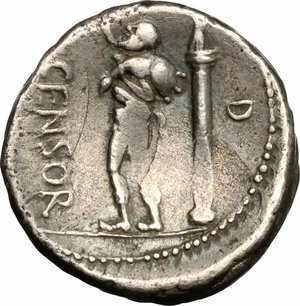 The arson started at the Temple of Juppiter, destroying also the Tabularium, to which the mint was in close connection (Coarelli). 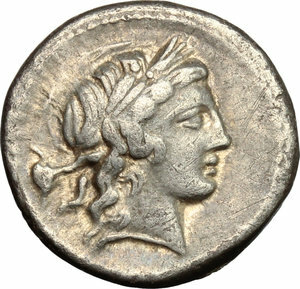 The Mint and Tabularium were rebuilt by Q .Lutatius Catulus and re-opened in 78 BC. 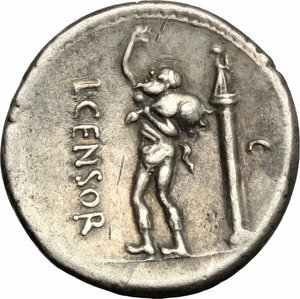 3) The IIIvirate leader was L.Censorinus, because of his name appearing alone at the obverse of the series RRC 360/1, which is the first produced just after the fire in an emergency mint. 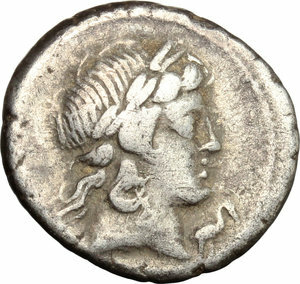 The veiled Moneta (cf. 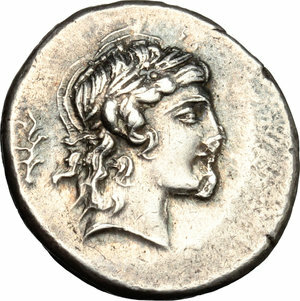 lot 235 and lot 236, the latter produced at the very beginning of the series, with numeral VI) on the obverse is kind of proof; Moneta is depicted exactly the same on RRC 396/1, and the veil is a sign of mourning for the destroyed temple and mint. 4) An updated catalog, based on a Corpus of 176 specimens, augments the known symbols (obv) and letters/numerals by five, and the known pairs from 24 to 37, as depicted in the table above. The new pairs are highlighted bold, provided by a progressive number (PN) and by the known specimens (SN). In the right column, the RRC Table XXIX is reported for comparison. 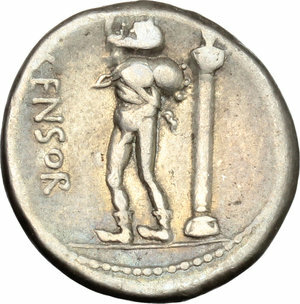 In this way, the few dies of L.CENSOR with symbols finds a reasonable framework for the first time: they were the first dies produced after the fire, to test a new system of control-marks, thereafter immediately applied to RRC 360/1 and, exactly in the same way, in the Crepusius coinage. 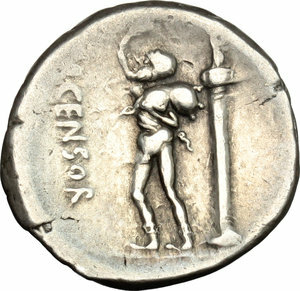 In fact, Crepusius re-uses most of the symbols of Censor, and combine them with letters and numerals, all ingredient present in “Censor’s experiment”. This is the most reasonable way to understand the otherwise inexplicable mixture of combinations that RRC tries to describe with its 1a/1b/1c. In fact, this is a single production, and to split it into free parts is rather a stretch, inasmuch as all of the dies are linked together. The four unsigned dies (Nil) of Censor that survived the fire were mixed with twenty or so dies with symbols/letters. The aim was to mark the dies so that to have a better control on them, now placed in a less secure temporary mint. That experiment ended RRC 363/1 and precisely date “our coins” to the first half of July 83 BC. Then RRC 360/1 followed, expressing the mourning for the big Capitol fire and also the need of giving a collegial certification of the restarted mint production by all the three moneyers. 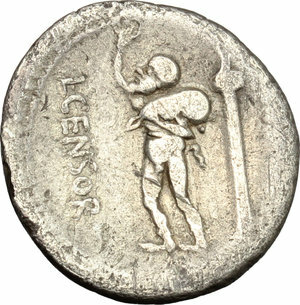 After a month or so, it was stopped and Crepusius started to mint his coinage, exploiting in full the experience acquired by Censor’s experiment. Among the coins presented here, many are not listed in RRC’s Table XXIX (Pair Number 5, 13, 15, 17, 23, 35 offered for the first time in a public sale) and some are not in any public collections: PN 23 is only in Paris and in such poor condition that it led Crawford astray. L. Censorinus. 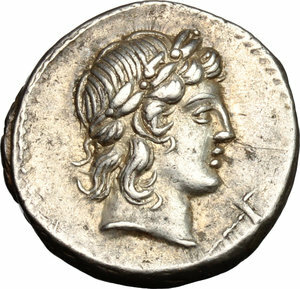 AR Denarius, 82 BC. Pair number: 4. D/ Laureate head of Apollo right. On right, lyre (partially off flan). R/ L. CENSOR. The satyr Marsyas standing left, with right arm raised and holding wine-skin over left shoulder; behind, column bearing statue on top. No control-mark in field. Cr. 363/1b. B. (Marcia) 24. AR. g. 3.69 mm. 16.00 RRRR. Of the highest rarity, only 5 specimens known. Old cabinet tone with golden hues. VF. L. Censorinus. 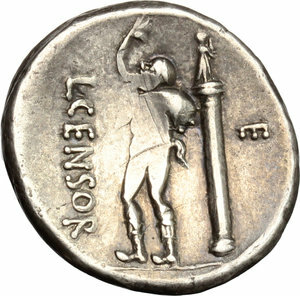 AR Denarius, 82 BC. Pair number: 5. D/ Laureate head of Apollo right. On right, lyre (partially off flan). R/ L. CENSOR. The satyr Marsyas standing left, with right arm raised and holding wine-skin over left shoulder; behind, column bearing statue on top. On right, letter E. Cr. 363/1a. B. (Marcia) 24. AR. g. 4.09 mm. 18.00 RRRR. Of the highest rarity, only 3 specimens known. Full weight. Old cabinet tone. VF. Ex Artemide July 7 2007, lot 259. L. Censorinus. 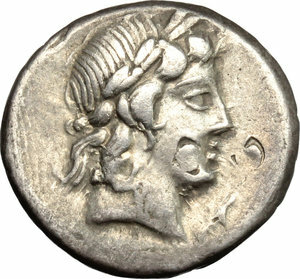 AR Denarius, 82 BC. Pair number: 7. D/ Laureate head of Apollo right. On right, traces of ant. R/ L. CENSOR. The satyr Marsyas standing left, with right arm raised and holding wine-skin over left shoulder; behind, column bearing statue on top. On right, VI. Cr. 363/1a. B. (Marcia) 24. AR. g. 3.63 mm. 18.00 RR. Very rare, 16 specimens known. Superb old cabinet tone. Good VF. L. Censorinus. 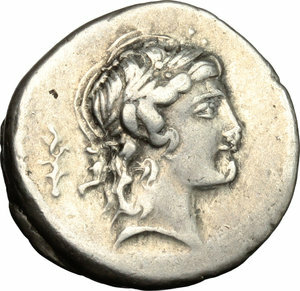 AR Denarius, 82 BC. Pair number: 10. D/ Laureate head of Apollo right. On right, stork. R/ L. CENSOR. The satyr Marsyas standing left, with right arm raised and holding wine-skin over left shoulder; behind, column bearing statue on top. No control-mark. Cr. 363/1b. B. (Marcia) 24. AR. g. 3.81 mm. 18.00 RRR. Extremely rare, 10 specimens known. Toned. About VF. L. Censorinus. 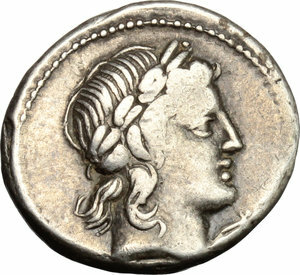 AR Denarius, 82 BC. Pair number: 12. D/ Laureate head of Apollo right. On left, wreath. R/ L. CENSOR. The satyr Marsyas standing left, with right arm raised and holding wine-skin over left shoulder; behind, column bearing statue on top. On right, letter D. Cr. 363/1a. B. (Marcia) 24. AR. g. 3.35 mm. 17.50 RRR. Extremely rare, 10 specimens known. Metal flaw on edge. Iridescent old cabinet tone. Good VF. L. Censorinus. 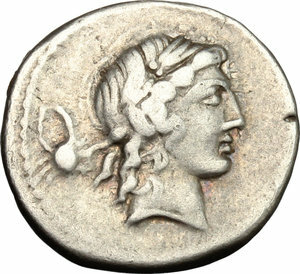 AR Denarius, 82 BC. Pair number: 13. D/ Laureate head of Apollo right. On left, wreath. R/ L. CENSOR. The satyr Marsyas standing left, with right arm raised and holding wine-skin over left shoulder; behind, column bearing statue on top. On right, letter C. Cr. 363/1a. B. (Marcia) 24. AR. g. 3.94 mm. 17.50 RRRR. Of the highest rarity, only 5 specimens known. Full weight. Perfectly centred and prettily toned. Good VF. L. Censorinus. 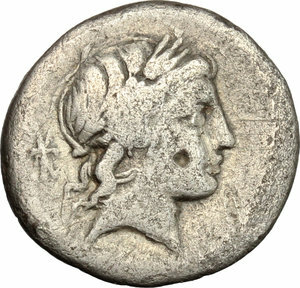 AR Denarius, 82 BC. Pair number: 15. D/ Laureate head of Apollo right. On right, fish. R/ L. CENSOR. The satyr Marsyas standing left, with right arm raised and holding wine-skin over left shoulder; behind, column bearing statue on top. On right, letter D. Cr. 363/1a. B. (Marcia) 24. AR. g. 3.96 mm. 17.50 RRRR. Of the highest rarity, only 5 specimens known. Full weight. Banker's marks on obverse. Toned. VF. L. Censorinus. 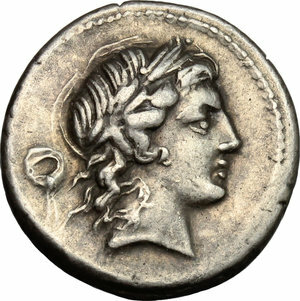 AR Denarius, 82 BC. Pair number: 15. D/ Laureate head of Apollo right. On right, [fish] off flan. R/ L. CENSOR. The satyr Marsyas standing left, with right arm raised and holding wine-skin over left shoulder; behind, column bearing statue on top. On right, letter D. Cr. 363/1a. B. (Marcia) 24. AR. g. 3.85 mm. 16.50 RRRR. Of the highest rarity, only 5 specimens known. Old cabinet tone. VF. The gash across the reverse surface is an 'adjustment al marco'. 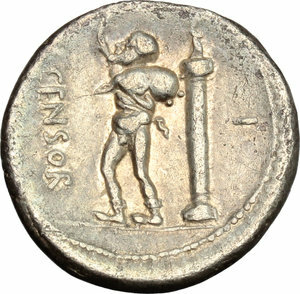 (C. Stannard 'The adjustment al marco of the weight of Roman Republican denarii blanks by gouging' in 'Metallurgy in numismatics vol 3' Royal Numismatic Society, 1993). L. Censorinus. 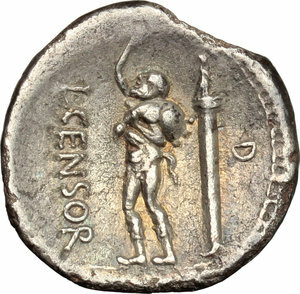 AR Denarius, 82 BC. Pair number: 17. D/ Laureate head of Apollo right. On right, fish. R/ L. CENSOR. The satyr Marsyas standing left, with right arm raised and holding wine-skin over left shoulder; behind, column bearing statue on top. On right, letter [P] at the edge of the flan and worn out. Cr. 363/1a. B. (Marcia) 24. AR. g. 3.73 mm. 18.00 RRRR. Of the highest rarity, only 4 specimens known (only one with letter P readable). Old cabinet tone. VF. L. Censorinus. 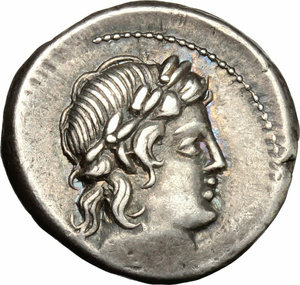 AR Denarius, 82 BC. Pair number: 21. D/ Laureate head of Apollo right. On right, trident. R/ L. CENSOR. The satyr Marsyas standing left, with right arm raised and holding wine-skin over left shoulder; behind, column bearing statue on top. On right, letter A. Cr. 363/1a. B. (Marcia) 24. AR. g. 3.96 mm. 18.00 RR. Very rare, 13 specimens known. Good metal and full weight. Brilliant, superb and lightly toned. EF. L. Censorinus. 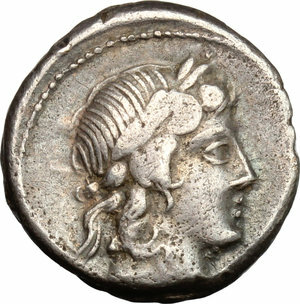 AR Denarius, 82 BC. Pair number: 23. D/ Laureate head of Apollo right. On left, branch. R/ L. CENSOR. The satyr Marsyas standing left, with right arm raised and holding wine-skin over left shoulder; behind, column bearing statue on top. No control-mark. Cr. 363/1b. B. (Marcia) 24. AR. g. 3.84 mm. 18.00 RRRR. Of the highest rarity, only 5 specimens known. Lovely iridescent old cabinet tone. Obverse die-break, otherwise EF/About EF. 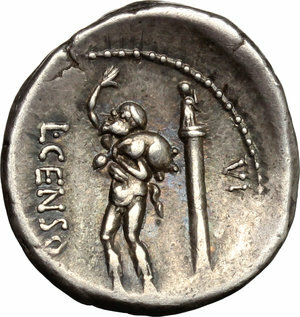 L. Censorinus. 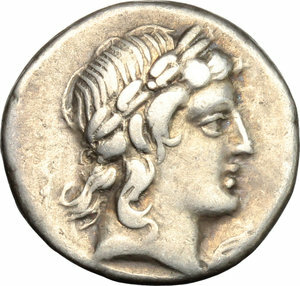 AR Denarius, 82 BC. Pair number: 23. D/ Laureate head of Apollo right. On left, branch. R/ L. CENSOR. The satyr Marsyas standing left, with right arm raised and holding wine-skin over left shoulder; behind, column bearing statue on top. No control-mark. Cr. 363/1b. B. (Marcia) 24. AR. g. 4.10 mm. 17.50 RRRR. Of the highest rarity, only 5 specimens known. Overweight, well centred, prettily toned. Minor obverse die-break. Good VF. L. Censorinus. 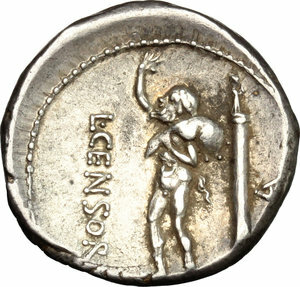 AR Denarius, 82 BC. Pair number: 28. D/ Laureate head of Apollo right. On left, crab. R/ L. CENSOR. The satyr Marsyas standing left, with right arm raised and holding wine-skin over left shoulder; behind, column bearing statue on top. On right, letter G. Cr. 363/1a. B. (Marcia) 24. AR. g. 3.84 mm. 17.00 RRRR. Of the highest rarity, only 6 specimens known. Superb iridescent tone. VF. 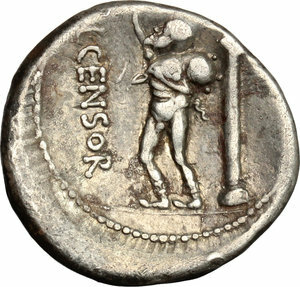 L. Censorinus. 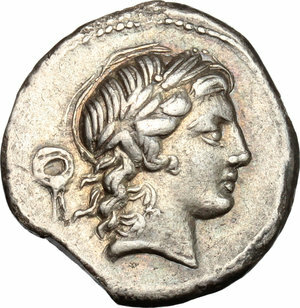 AR Denarius, 82 BC. Pair number: 34. D/ Laureate head of Apollo right. On left, leaf. R/ L. CENSOR. The satyr Marsyas standing left, with right arm raised and holding wine-skin over left shoulder; behind, column bearing statue on top. On right, letter I. Cr. 363/1a. B. (Marcia) 24. AR. g. 3.83 mm. 18.00 RRR. Extremely rare, 10 specimens known. Superb old cabinet tone, with golden hues. Good VF/About EF. 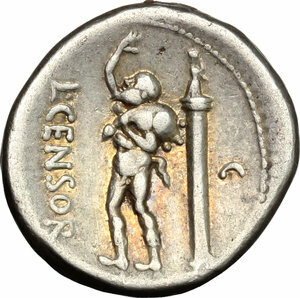 L. Censorinus. 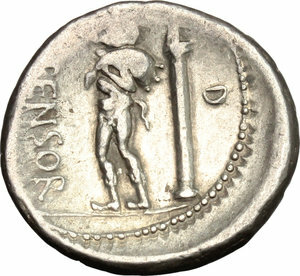 AR Denarius, 82 BC. Pair number: 35. D/ Laureate head of Apollo right. On left, fulmen. R/ L. CENSOR. The satyr Marsyas standing left, with right arm raised and holding wine-skin over left shoulder; behind, column bearing statue on top. On right, traces of VII worn out. Cr. 363/1a. B. (Marcia) 24. AR. g. 3.44 mm. 18.00 RRRR. Of the highest rarity and unpublished, only 3 specimens known. Banker's mark on obverse. Toned. F.